@Louthrax: When I try to run IDECDEX.COM it give me a error message --> "CD Drive Letter Not Found" but MSXCDEX.COM install fine what is the differences between them? Hum, does the CD audio music works for Knightmare Gold with Novaxis / SCSI CD-ROM ? @Louthrax: Well, sound very challenging to me try to understand how to Play AUDIO CD TRACKS but I think is worthy . I keep you informed if i get some progress. @lintweaker: Could you please send me the source file through my email over MSX.ORG (My profile/contact). will be very appreciated. 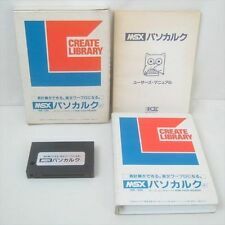 Adding it to the downloads on MSX.ORG is also an interesting option for preservation purposes. more to come once I finish get some if it building again (Mega Reporter, Novaxis SCSI BIOS).